We have heard from numerous clients – located on two sides of the globe – that driver shortages are one of their most pressing business challenges. So while, naturally, we at Optibus are focused on saving operational costs and making mass transportation operations better, sometimes we need to focus on what really matters – the operations and driver-relations challenge associated with drivers shortages. This issue can be addressed with both long-term and short-term planning strategies. In the long term, agencies can increase driver retention and help driver recruitment by planning more appealing driver duties – what Liz Stayner, a Planning Manager at MV Transportation called “driver work quality.” Similarly, if better rosters are created, drivers can benefit from a better work-life balance. 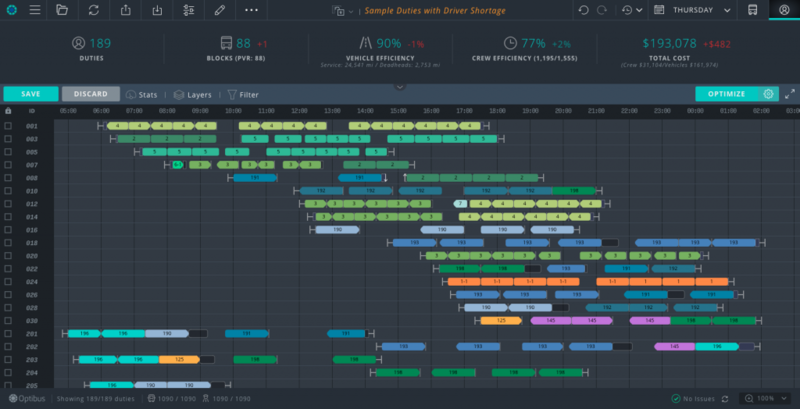 And in the short term, agencies must be prepared for the worst-case scenario — when there simply aren’t enough drivers to fill in the schedule, a minor catastrophe which can also be efficiently dealt with using next-generation scheduling. This post will demonstrate a few ways in which the Optibus platform can help schedulers to (1) make schedules when drivers are the limiting factor, and (2) make duties that are better for drivers. When there aren’t enough drivers, transit agencies may find themselves with a schedule that was designed for more drivers than they have available. This is a major issue; re-working the schedule may take time or create sub-optimal results, but the agency simply cannot maintain service levels with the existing number of drivers. This is where setting global constraints in Optibus comes in handy. For example, consider this schedule that is currently configured to require 189 drivers, and costs $192,595 to operate daily. The current schedule may look fine, but in reality, we have a driver shortage. We’d like to check what happens when we indicate that we cannot exceed 185 drivers as a result of the shortage. After optimizing, we have a new schedule that requires only 182 drivers. The operating cost increased slightly, but more importantly, we can be confident that our schedule is operational. Next, we will look at how to make duties better for the existing drivers, when decreasing the duty count is not the most urgent concern. Returning to the original schedule, let’s instead consider how to make the existing duties more convenient for drivers. Using the KPI dropdown menu on the Gantt chart, we can easily see the distribution of duty types. We can see that there is a huge number of split duties. Split duties are comprised of multiple shifts with a split in the middle. The specifications of this split – including whether or not it includes compensation – can be defined by agencies in the preferences. In general, split duties aren’t particularly appealing to drivers, because their work day is divided by a longer, unpaid break. Let’s filter the duties and apply a few stats to get a closer look at some of these split duties. Splits can be pretty inconvenient for drivers, so we will use some preferences to decrease the number of split duties. 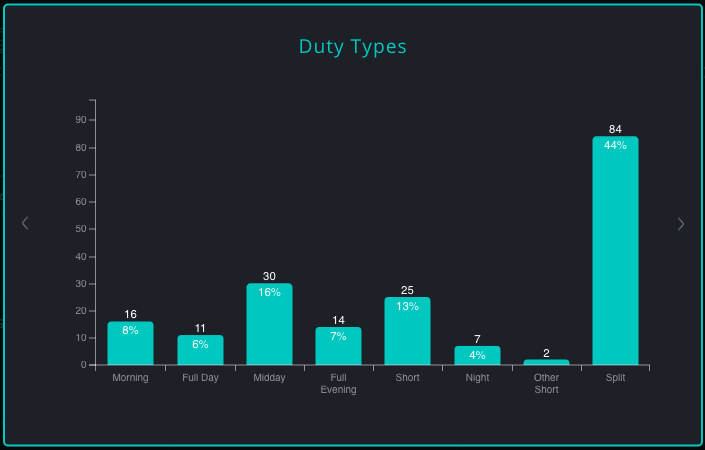 This is the area in the preferences where the duty types are defined. We will add penalties to the duties that are less ideal for drivers. 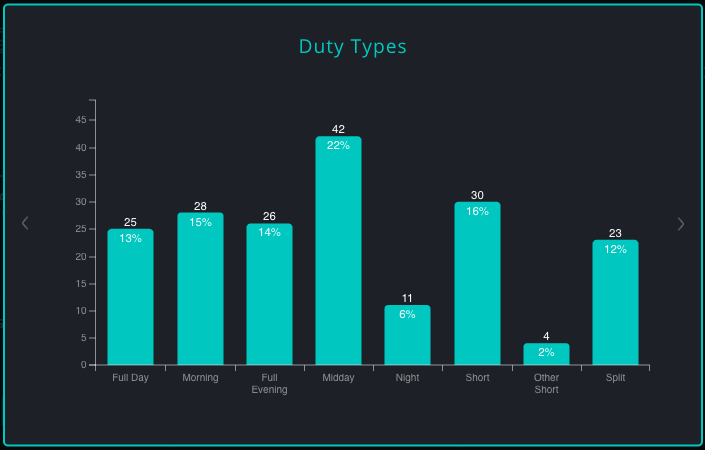 After manipulating some preferences in order to decrease undesirable duty types, we can let the Optibus algorithm take care of the rest. This new schedule looks much better! The number of split duties decreased drastically, and the proportion of Full Day, Morning, and Full Evening shifts is higher. And, notably, our total duty count did not increase. Overall, this schedule presents much higher quality duties for drivers. In summary — good working conditions and cost savings are not mutually exclusive! 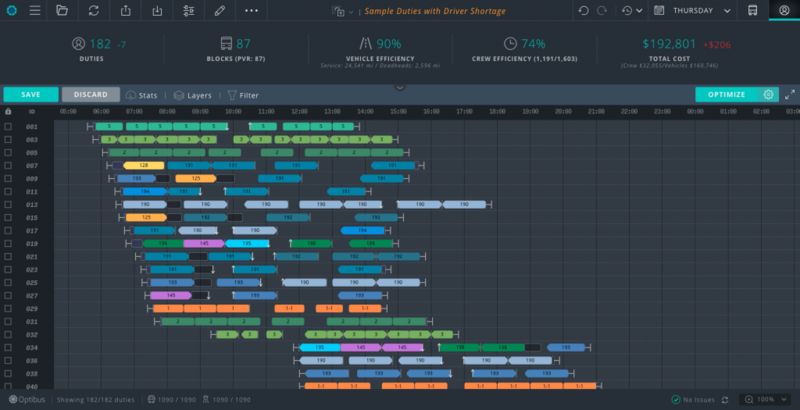 With the vast array of driver preferences available on the Optibus platform, schedulers can easily define scenarios that will be more appealing to drivers. And in the worst case, when driver shortage is the biggest barrier to providing quality bus service, schedulers can set firm caps on the number of duties in their schedule — without hurting the service. Just like new mobility alternatives are changing the game in the urban transit space, next generation scheduling carries enormous transformational potential. ehavioral.